A campaign that aims to tackle the stigma around mental health has been given £20m in funding from the Department of Health, Comic Relief and the Big Lottery Fund. 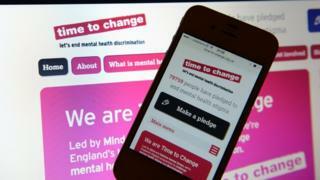 The Time To Change initiative, run by charities Mind and Rethink Mental Illness, works with schools, employers and local communities to reduce discrimination and raise awareness. It has received £30m in funding so far. More than 800 schools and almost 400 employers have taken part. The charities say that as a result of the campaign, the proportion of people reporting discrimination as a result of mental health issues has dropped from 42% to 28%. Earlier this week, data from NHS Digital revealed that young women are the highest risk group in England for mental health problems. Health Secretary Jeremy Hunt said: "Tackling the stigma associated with mental health problems is essential if we are to break down barriers and encourage people to seek help before they reach crisis point. "Time To Change is already making a difference, but with recent studies showing that just 50% of people seek help following a suicide attempt, it's clear that we still have major work to do." Jo Loughran, interim director of Time To Change, said: "Since Time To Change began, we've made real progress in transforming public attitudes and empowering thousands of people to tackle discrimination, but we've always said that this is the work of a generation and there's still more work to be done."